Mariam Elmarsafy and Leah Mindorff want a total of six minutes of your time to teach you about important threats to our water. Elmarsafy and Mindorff won the graduate and undergraduate student categories, respectively, of Wilfrid Laurier University’s Three-Minute Thesis (3MT) competition, which challenges students to present their research to a lay audience in three minutes or less. Elmarsafy now advances to the provincial 3MT competition at McMaster University in Hamilton, on April 17. The winners work in different labs, on different topics, but their talks have a common underlying message: human activity is negatively affecting water and we need to better understand what’s going on to turn things around. Elmarsafy, a first-year master’s student in Integrative Biology, researches how tiny invertebrates commonly called water fleas respond to changes in water salinity. For her fieldwork, Elmarsafy visited Moon Lake, a remote lake in the drought-prone plains of North Dakota known for its fluctuating salinity. In rainier times, the water is fresh. In times of drought, however, its salinity levels can be comparable to the ocean. There, Elmarsafy collected a metre-long sediment core from the bottom of the lake. Each centimetre goes five years back in time, so her core sample provided information dating back 500 years. In the sample, Elmarsafy looked for and found water flea eggs, some of them dormant but viable despite being decades or centuries old. Using a technique called “resurrection ecology,” she hatched them in the lab to determine how they responded to past changes in salinity. The results so far? Salty water isn’t good for water fleas. As climate change raises temperatures, water evaporation increases, resulting in saltier lakes. Climate change could therefore result in declining water flea numbers and even declining water flea species, which could have major effects on animals higher up the food chain. 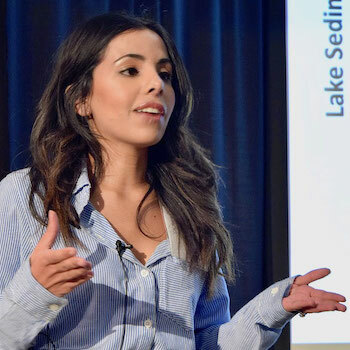 Elmarsafy, however, chose to end her 3MT talk on a hopeful note: if we take care of our planet, we can maintain the health of lake ecosystems. 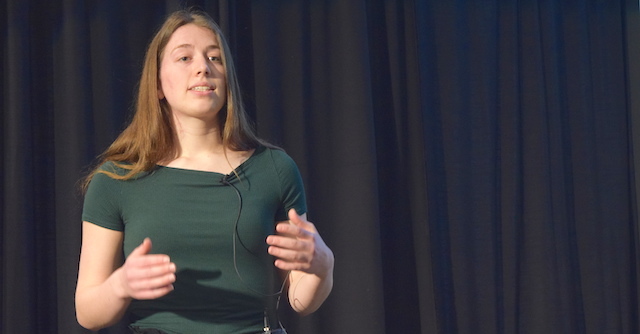 Mindorff, a fourth-year student majoring in biology and geography, focused her talk on how dissolved organic matter in water interacts with metals – specifically copper. Copper naturally enters water from sources such as copper ore deposits. However, when mining exposes more ore and acidic emissions from mines flow into water, the concentration of copper in the water goes up. Organic matter in water can react with dissolved metals, resulting in more toxic chemical forms of the metals. Fish and other animals can die from metal toxicity. Just as tea leaves and spices infuse water with colour and flavour, the presence of dissolved organic matter changes water. And just as Earl Grey is different from orange pekoe, different types and concentrations of organic matter – including plant and animal material, microbes, soil and algae – result in water with different properties. While regulations set limits on metals in water to levels considered safe, the toxicity prediction models underlying the regulations don’t account for the unique profiles of dissolved organic matter at different sites, says Mindorff. Mindorff did her fieldwork near Yellowknife, where she collected water samples in different locations. She then ran tests at labs on Laurier’s Waterloo campus and found different dissolved organic matter resulted in differences in copper toxicity. Her conclusion? Factoring in these differences could improve the reliability of toxicity prediction models and therefore improve water safety. Both Elmarsafy and Mindorff have spent close to a year on their research. How did they turn their work into a three-minute presentation with only one slide? Lots of rewriting and practice. The 3MT workshops hosted by Nadine LeGros from the Teaching and Learning also helped a lot, they say. The students credit their advisors – Assistant Professor Derek Gray for Elmarsafy, Professor Jim McGeer for Mindorff – with getting them into research and guiding their work. They started out volunteering in their respective professors’ labs as undergraduate students and became increasingly involved. Both Gray and McGeer say their students are now making real-world contributions. “Leah’s work is contributing to our understanding of how to sustain our water resources in the face of increased industrial and urban development,” says McGeer. There is no provincial competition for undergraduates – this is the first year Laurier has held a competition at that level. Nonetheless, Mindorff says she was thrilled with her win – both for the prize money and the opportunity to communicate her research to a wider audience.